Which is the better smartphone? 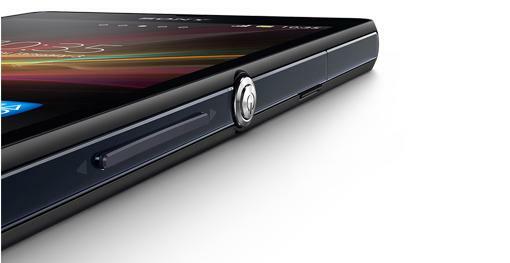 Sony's upcoming Xperia Z or the Apple iPhone 5? Announced at the Consumer Electronics Show (CES) in Las Vegas last month, the Sony Xperia Z is the company's new flagship Android phone for 2013. Unlike most previous Sony smartphones, there appears to be a genuine buzz about this device. It features a 5in full HD 1080p display, a 13-megapixel camera and is both water and dust-resistant. The Xperia Z is very much a high-end smartphone, so it will be competing firmly against the market leader, Apple's iPhone 5. How will it stack up? Let's find out. The design of the Sony Xperia Z may very well be what sets it apart from other flagship phones of 2013. While it looks no different to many other smartphones on first glance, the Xperia Z is dust and water resistant, rated to IP55 and IP57 standards. The water resistant capabilities mean all ports are covered with flaps, but this is something we can live with as Sony promises the Xperia Z can be submerged in water for up to 30 minutes without damage. Sony says it conducted research and took feedback on board from consumers which suggested that water resistance is a requested feature in a smartphone. We feel the water resistant capabilities will be welcome news to many Aussies. It's a feature that's not normally seen on high-end flagship devices so it could be a huge ace up Sony's sleeve. 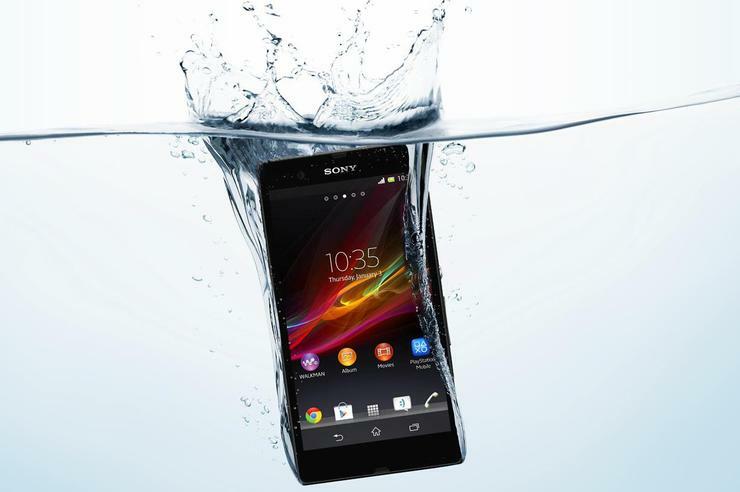 Sony says it didn't want to compromise on the Xperia Z's design by making it water resistant. The feature doesn't appear to have come at a cost of looks, either. Sony has already made mention of the fact it didn't want to compromise on Xperia Z's design by making the phone water resistant. The device is just 7.9mm thick, only 0.3mm thicker than the iPhone 5. Sony says the Xperia Z's "rounded edges and smooth reflective surfaces on all sides" will make it comfortable to hold and use. Our only concern is long term durability. The Xperia Z has a full pane of glass on both the front and the back, so it remains to be seen how it will fare if dropped. The Xperia Z's design certainly differs to the iPhone 5. Its feather light 112g weight is one of the best features of the device. Apple certainly deserves a huge amount of credit for managing to make the phone significantly lighter than its predecessor while increasing its overall footprint. At just 7.6mm, the iPhone 5 is also one of the thinnest smartphones on the market. Overall, there's an extraordinary attention to detail in the construction of the iPhone 5 and it's something that most competitors lack. However, the anodised aluminium used on the back and the edges of the iPhone 5 seems to be easily scratched and marked, which is something potential buyers should keep in mind. Aside from its water resistant capabilities, the standout feature of the Sony Xperia Z is its 5in screen. It's a full HD display with a resolution of 1920x1080. Full HD screens are set to become the norm in 2013 and while Sony isn't the first to market with this technology (the HTC Butterfly and Oppo Find 5 came first), the Xperia Z will be one of the first to officially land on Australian shores. The full HD resolution of the Xperia Z gives its display a pixel density of 441ppi, among the highest we've ever seen on a smartphone. This means it should display ultra crisp text with minimal, visible aberrations. The only potential downside to a full HD display is how much of an effect it will have on battery life, a question that can't be answered until we put the phone through its paces for a few weeks. Sony quotes just five and a half hours of video playback, which doesn't sound very promising. The Sony Xperia Z has a 5in, full HD display. Sony says the display on the Xperia Z uses technology it calls Mobile Bravia Engine 2. The feature claims to offer real-time contrast optimisation, increased colour saturation, noise reduction for video content and a sharpness filter. The company also says it has eliminated a layer in the construction of the screen, bringing the actual display closer to the glass surface. It's not exactly new — we've seen this effect on many smartphones before — but the result is usually an image that appears as if its floating on the surface of the screen. The Xperia Z certainly has its work cut out in competing with the iPhone 5's display, which is one of the best on the market. It's larger than previous iPhone's at 4in, but it's the same width as the screen on every other iPhone, only taller. Apple says the decision to keep the phone at the same width ensures that the span of a user's thumb can reach all the way across the display when using the phone single-handedly. The iPhone 5's display is one of the best on the market. Sony will launch the Xperia Z with Android 4.1 (Jelly Bean) but the company has promised it will be upgraded to the latest 4.2 version "shortly after launch". Perhaps the most interesting software addition is what Sony calls "Battery Stamina mode". The feature prevents applications from running when the screen is locked, therefore saving power of the 2330mAh battery and apparently improving standby time "by at least four times". Sony says you can individually select apps to bypass this feature if you wish, so there's an element of personalisation. Critically, the software on the Xperia Z appears to be very similar to the stock version of Android. Sony has a poor track record with timely Android updates to its smartphones, so we remain hopeful that a light UI skin may mean the update process of the Xperia Z can be more timely than previous models. 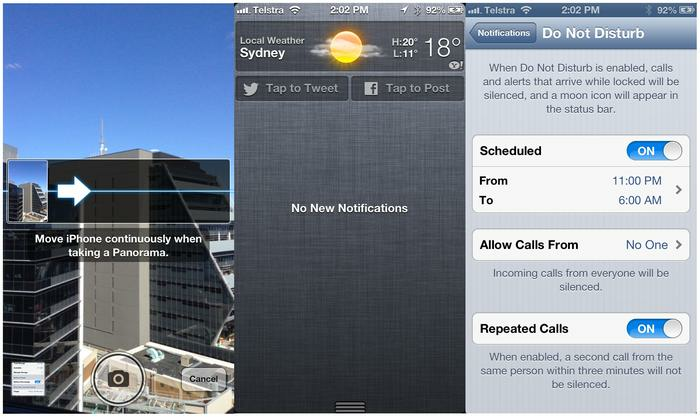 Panorama photos, Facebook posts from the notifications screen and the 'Do Not Disturb' feature on the iPhone 5. The iPhone 5 on the other hand runs Apple's latest iOS 6 operating system. Using the device is a very similar experience to previous iPhone's, though Apple says iOS 6 has added over 200 new features to the platform. The Xperia Z has a 13-megapixel camera that features an Exmor RS image sensor. Sony claims it's the world's first smartphone image sensor with HDR (High Dynamic Range) video. This feature certainly looks appealing and should theoretically improve images that are captured with bright objects near darker ones. A good example is capturing a photo indoors with a bright window in the frame. It sounds impressive, but can't be judged until we see sample images and put the camera through its paces ourselves. Other features of the camera include a superior auto setting that claims to capture photos with "optimal" settings, a sweep panorama mode and the ability to capture still photos while simultaneously recording video. The latter isn't a new feature — HTC has used it on a number of its phones including the popular One X and One XL. Curiously, the Xperia Z can also capture video underwater. The camera on the iPhone 5 is one of the best we've used on a smartphone. The 8-megapixel sensor captures excellent photos with great detail. Many of the shots produced are comparable to some dedicated point-and-shoot digital cameras. 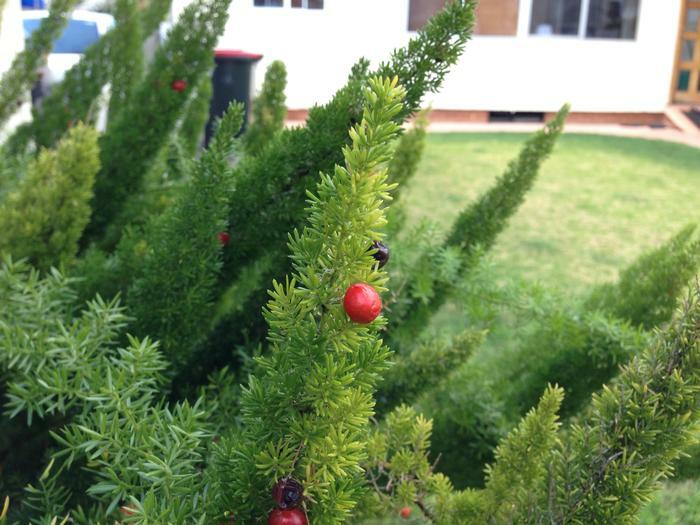 During testing, we found that the iPhone 5's camera consistently produced accurate colours and impressive detail levels. Macro performance is excellent, and the lens is quick to focus on close range subjects. The iPhone 5 can also take quality photos in low light conditions, though these images are still noisier than most good point-and-shoot cameras. The Sony Xperia Z certainly boasts impressive specifications. It's powered by a quad-core Qualcomm Snapdragon S4 Pro 1.5GHz Krait processor, has 2GB RAM and comes with 16GB of internal memory. There's also a microSD card slot, which will be welcome news to many ardent Android fans. A theoretical maximum 48GB of memory will keep most potential users satisfied. The Xperia Z is 4G capable for Australia, so it's compatible with the 1800MHz 4G networks used down under by Telstra and Optus. It also has an NFC chip. The iPhone 5 is powered by Apple's own A6 processor, has 1GB of RAM and comes with 16, 32 or 64GB of internal memory depending on the model you choose. Apple says the A6 processor is two times faster than the A5 chip used on the iPhone 4S and has two times faster graphics. 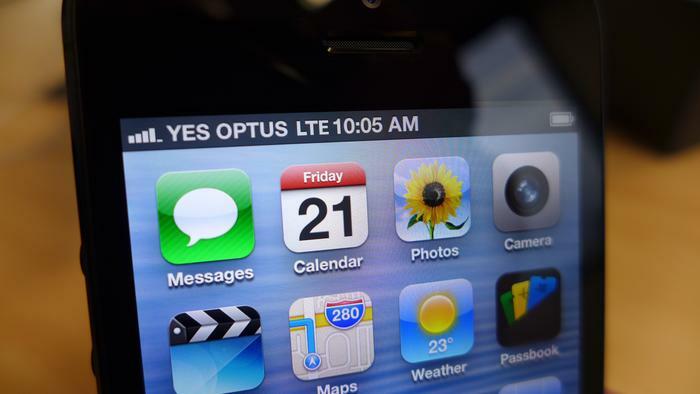 There's no NFC capability but the iPhone 5 is 4G compatible in Australia. The iPhone 5 also uses a smaller SIM card standard called Nano-SIM. 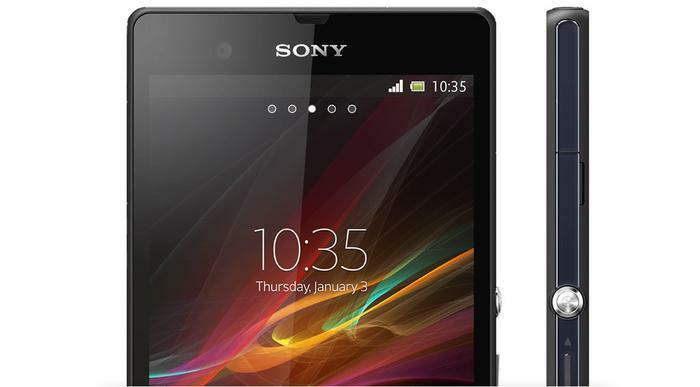 The Sony Xperia Z will launch in Australia in March 2013 on Telstra, Optus and Vodafone. Telstra has already published a "register your interest" Web page for the Xperia Z, but no pricing has been announced. The Apple iPhone 5 is available now through all major Australian telcos. What do you think about the Sony Xperia Z and the Apple iPhone 5? Which smartphone would you buy and why? Let us know your thoughts in the comments below!